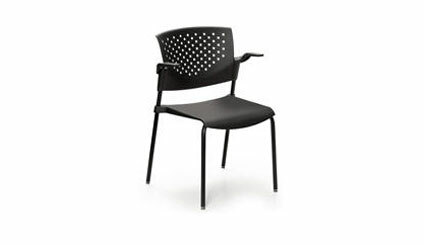 ART DESIGN INTERNATIONAL PENTA STACKING CHAIR WITH ARMS | ADI| Alliance Interiors Inc.
Penta – The ideal polypropylene stack chair for those wanting a quality ADI made frame, great comfort at an affordable price. Available in regular height, bar height, counter height and as a task chair or drafting stool, the Penta has all the features needed to fit in any cafeteria, school or waiting area. Available in black only. I love the ADI Penta Stacking chair as it can be put anywhere and I am amazed at the comfort for an economy stacker. The Penta stacker is an exceptional value. The molded polypropylene back and seat satisfy the comfort needs for a wide range of users and can be cleaned with just a damp cloth. I use the Penta stacker in Auditoriums, cafeterias, lunchrooms, waiting areas, training rooms, meeting rooms, home offices, or as a guest chair or side chair in any office. I have also used them in warehouses, assembly lines in plants and automotive shops. The ADI Penta stacking chair can compliment any contemporary modern office furniture.